The foodservice industry is always changing, which makes it challenging for marketers to develop winning campaigns. With so many changes taking place, it can be a daunting task for marketers to stay on top of the latest changes and stay one step ahead of the competition. But what if there was a secret weapon that could help marketers stay ten steps ahead of their competitors? There is, and it’s something that we here at CHD Expert are very familiar with: Data. Many of today’s top foodservice brands are already employing data to improve their sales and marketing strategies. By using industry statistics, customer information, and competitor intelligence, these brands are able to create top-of-the-line programs. Thankfully marketing teams of any size can have the same advantages, all with the power of data. Here are five ways that marketers can use data to better plan foodservice marketing strategies. Perform a competitive analysis. 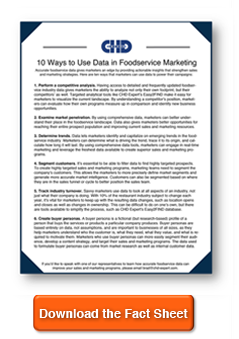 Having access to detailed and frequently updated foodservice industry data gives marketers the ability to analyze not only their own footprint, but their competitors’ as well. Targeted analytical tools like CHD Expert’s Easy2FIND make it easy for marketers to visualize the current landscape. By understanding a competitor’s position, marketers can evaluate how their own programs measure up in comparison and identify new business opportunities. Examine market penetration. By using comprehensive data, marketers can better understand their place in the foodservice landscape. Data also gives marketers better opportunities for reaching their entire prospect population and improving current sales and marketing resources. Determine trends. Data lets marketers identify and capitalize on emerging trends in the foodservice industry. Marketers can determine what is driving the trend, trace it to its origin, and calculate how long it will last. By using comprehensive data tools, marketers can engage in real-time marketing and leverage the freshest data available to create superior sales and marketing programs. Segment customers. It’s essential to be able to filter data to find highly targeted prospects. To create highly targeted sales and marketing programs, marketing teams need to segment the company’s customers. This allows the marketers to more precisely define market segments and generate more accurate market intelligence. Customers can also be segmented based on where they are in the sales funnel or cycle to better position the sales team. Track industry turnover. Savvy marketers use data to look at all aspects of an industry, not just what their company is doing. With 10% of the restaurant industry subject to change each year, it’s vital for marketers to keep up with the resulting data changes, such as location opens and closes as well as changes in ownership. This can be difficult to do on one’s own, but there are tools available to simplify the process, such as CHD Expert’s Easy2FIND database. Here at CHD Expert we know data. We meticulously collect, analyze, segment and manage millions of data records in order to provide our clients with the most detailed information possible for today’s evolving foodservice industry. We also update our databases monthly to ensure that the foodservice data our clients are using reflects the most recent changes in the marketplace.